In much of the world fishing communities are dying out and commercial fishing industries are in a state of crisis due to mismanagement, over exploitation and the environmental degradation of marine ecosystems. Until recently, Bristol Bay faced an entirely different problem. Too many fish. In the 1970s the Alaska Department of Fish and Game began to manage salmon runs by controlling fishing periods to allow the optimum number of salmon for each fishing district to escape fishing nets, swim up stream and spawn, thus assuring salmon stocks for the future. 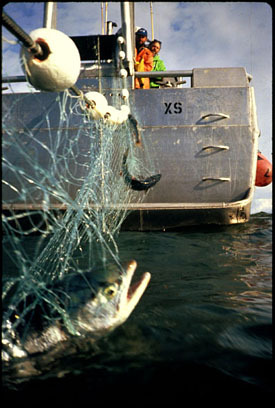 As a result of these programs, a moratorium on high sea drift net fishing and weather phenomena like El Niño, during the late 80s and 90s Bristol Bay had record salmon returns and harvests year after year. 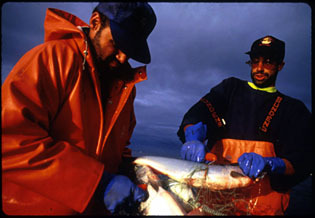 Bristol Bay was considered a successful example of a manageable and renewable natural resource. This was good news, bad news for fishermen. Recession in Japan - Alaska's largest salmon buyer - an increase in farmed salmon on the market and an abundance of sockeyes in Bristol Bay caused the price of salmon to drop drastically.